In 1895 he was first accepted into the General Staff Academy, where he did not meet the academic requirements in the first of his two years. After this disappointment, Denikin attempted to attain acceptance again. On his next attempt he did better and finished fourteenth in his class. However, to his misfortune, the Academy decided to introduce a new system of calculating grades and as a result Denikin was not offered a staff appointment after the final exams. He protested the decision to the highest authority (the Grand Duke).[which?] After being offered a settlement according to which he would rescind his complaint in order to attain acceptance into the General Staff school again, Denikin declined, insulted. In 1916, he was appointed to command the Russian 8th Army Corps and lead troops in Romania during the last successful Russian campaign of the war, the Brusilov Offensive. Following the February Revolution and the overthrow of Tsar Nicholas II, he became Chief of Staff to Mikhail Alekseev, then Aleksei Brusilov, and finally Lavr Kornilov. Denikin supported the attempted coup of his commander, the Kornilov Affair, in September 1917 and was arrested and imprisoned with him. After this Alekseev would be reappointed commander-in-Chief. Following the October Revolution both Denikin and Kornilov escaped to Novocherkassk in the Northern Caucasus and, with other Tsarist officers, formed the anti-Bolshevik Volunteer Army, initially commanded by Alekseev. Kornilov was killed in April 1918 near Ekaterinodar and the Volunteer Army came under Denikin's command. There was some sentiment to place Grand Duke Nicholas in overall command but Denikin was not interested in sharing power. In the face of a Communist counter-offensive he withdrew his forces back towards the Don area in what came to be known as the Ice March. After that, in June-November 1918, Denikin launched the highly successful Second Kuban Campaign which gave him control of the entire area between the Black and Caspian Sea. In the summer of 1919, Denikin led the assault of the southern White forces in their final push to capture Moscow . For a time, it appeared that the White Army would succeed in its drive; Leon Trotsky, as the supreme commander of the Red Army, hastily concluded an agreement with Nestor Makhno's anarchist Revolutionary Insurrectionary Army of Ukraine (the 'Black Army') for mutual support. Makhno duly turned his Black Army east and led it against Denikin's extended lines of supply, forcing the Whites to retreat. Denikin's army would be decisively defeated at Orel in October 1919, some 360 km south of Moscow. The White forces in southern Russia would be in constant retreat thereafter, eventually reaching the Crimea in March 1920. Meanwhile, the Soviet government immediately tore up its agreement with Makhno and attacked his anarchist forces. After a seesaw series of battles in which both sides gained ground, Trotsky's more numerous and better equipped Red Army troops decisively defeated and dispersed Makhno's Black Army. In the territories it occupied, Denikin's army carried out mass executions and plunder, in what was later known as the White Terror. In the town of Maykop in Circassia during September 1918, more than 4,000 people were massacred by General Pokrovsky's forces. In the small town of Fastov alone, Denikin's Volunteer Army murdered over 1,500 Jews, mostly elderly, women, and children. I had not been with Denikin more than a month before I was forced to the conclusion that the Jew represented a very big element in the Russian upheaval. The officers and men of the Army laid practically all the blame for their country's troubles on the Hebrew. They held that the whole cataclysm had been engineered by some great and mysterious secret society of international Jews, who, in the pay and at the orders of Germany, had seized the psychological moment and snatched the reins of government. All the figures and facts that were then available appeared to lend colour to this contention. No less than 82 per cent of the Bolshevik Commissars were known to be Jews, the fierce and implacable 'Trotsky,' who shared office with Lenin, being a Yiddisher whose real name was Bronstein. Among Denikin's officers this idea was an obsession of such terrible bitterness and insistency as to lead them into making statements of the wildest and most fantastic character. Many of them had persuaded themselves that Freemasonry was, in alliance with the Jews, part and parcel of the Bolshevik machine, and that what they had called the diabolical schemes for Russia's downfall had been hatched in the Petrograd and Moscow Masonic lodges. When I told them that I and most of my best friends were Freemasons, and that England owed a great deal to its loyal Jews, they stared at me askance and sadly shook their heads in fear for England's credulity in trusting the chosen race. One even asked me quietly whether I personally was a Jew. 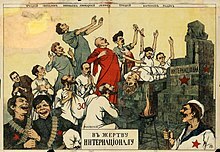 When America showed herself decidedly against any kind of interference in Russia, the idea soon gained wide credence that President Woodrow Wilson was a Jew, while Mr. Lloyd George was referred to as a Jew whenever a cable from England appeared to show him as being lukewarm in support of the anti-Bolsheviks. Denikin was a writer, and prior to World War I had written several pieces in which he criticised the shortcomings of his beloved Russian Army. His voluminous writings after the Russian Civil War (written while living in exile) are notable for their analytical tone and candour. Since he enjoyed writing and most of his income was derived from it, Denikin began to consider himself a full-time writer and developed close friendships with several Russian émigré authors—among them Ivan Bunin (a Nobel Laureate), Ivan Shmelev, and Aleksandr Kuprin. General Denikin was buried with military honours in Detroit. His remains were later transferred to St. Vladimir's Cemetery in Jackson, New Jersey. His wife, Xenia Vasilievna Chizh (1892–1973), was buried at Sainte-Geneviève-des-Bois cemetery near Paris. On October 3, 2005, in accordance with the wishes of his daughter Marina Denikina and by authority of the President of Russia, Vladimir Putin, General Denikin's remains were transferred from the United States and buried at the Donskoy Monastery in Moscow. The importance of Denikin's diary for explaining the relationship between "Great and little Russia, Ukraine" was cited by Putin during his May 24, 2009 visit to the Donskoy Monastery. "He says nobody should be allowed to interfere between us. This is only Russia's right." ^ The YIVO encyclopedia of Jews in Eastern Europe by YIVO institute for Jewish Research. ^ Florinsky, Michael T. (1961). Encyclopedia of Russia and the Soviet Union. McGraw-Hill. Retrieved 2013-07-12. ^ Mayer, Arno J. (2000). The Furies. Princeton University Press. p. 520. ISBN 9780691090153. Retrieved 2013-07-12. ^ Klier, John Doyle; Lambroza, Shlomo (12 February 2004). "Pogroms: Anti-Jewish Violence in Modern Russian History". Cambridge University Press – via Google Books. ^ Kenez, Peter, "The Ideology of the White Movement," Soviet Studies, 1980, no. 32. pp. 58–83. Christopher Lazarski, "White Propaganda Efforts in the South during the Russian Civil War, 1918-19 (The Alekseev-Denikin Period)," The Slavonic and East European Review, Vol. 70, No. 4 (Oct., 1992), pp. 688–707. Viktor G. Bortnevski, "White Administration and White Terror (The Denikin Period)," Russian Review, Vol. 52, No. 3 (Jul., 1993), pp. 354–366. ^ John Ernest Hodgson ("War Correspondent with the Anti-Bolshevik Forces"), "With Denikin's Armies: Being a Description of the Cossak Counter-Revolution in South Russia, 1918-1920", Temple Bar Publishing Co., London, 1932, pp. 54-56. ^ Bigg, Claire (October 3, 2005). "Russia: White Army General Reburied In Moscow". Radio Free Europe/Radio Liberty. Eighty-five years after fleeing into exile, General Anton Denikin was reburied with full honors at Moscow's Donskoy Monastery in a grand ceremony attended by some 2,500 people. ^ Login (2009-05-24). "Putin: 'You certainly should read' Anton Denikin's diary; specifically the part about 'Great and little Russia, Ukraine. He says nobody should be allowed to interfere between us. This is only Russia's - May. 24, 2009". KyivPost. Retrieved 2018-09-11. This page is based on the Wikipedia article Anton Denikin; it is used under the Creative Commons Attribution-ShareAlike 3.0 Unported License (CC-BY-SA). You may redistribute it, verbatim or modified, providing that you comply with the terms of the CC-BY-SA.